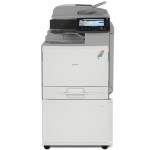 The RICOH MP C5503SP Multifunction Product (MFP) is engineered to work the way you do. 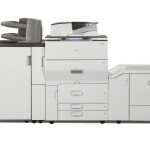 It combines high-quality, full-color output with productivity-enhancing capabilities so you can leverage a wider range of information in newer, smarter ways. 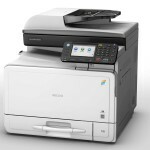 Transform your MFP into an information portal by connecting to the cloud from your smartphone, tablet or other mobile device and use these powerful systems to print, share and discover the value of customized convenience. 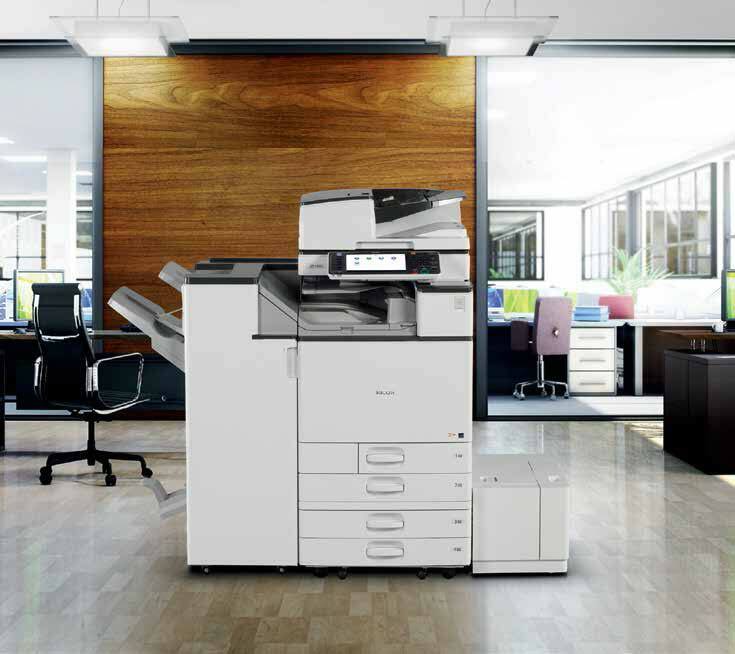 Packed with advanced versatility and energy-saving features in a space-saving design, it’s ideal for fast-paced offices with heavy workloads. Choose it as the primary system for your workgroup or as an integral part of the Ricoh Managed Document Services (MDS) strategy and boost productivity throughout your organization. 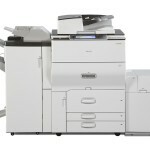 ● This powerful and innovative MFP delivers high-quality, monochrome or color output at up to 55 ppm for incredible throughput. ● It recovers from sleep mode with a fast, less than 10-second recovery time to preserve resources and productivity. 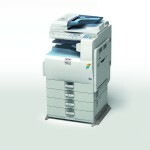 ● The MP C5503, comes standard with a 220-Sheet Single Pass Document Feeder (SPDF). ● Select the Internal Finisher to save floor space or choose from a wide range of external finishers to expedite workflow. ● The innovative PxP® toner melts at lower temperatures, requires less energy and minimizes operating costs. 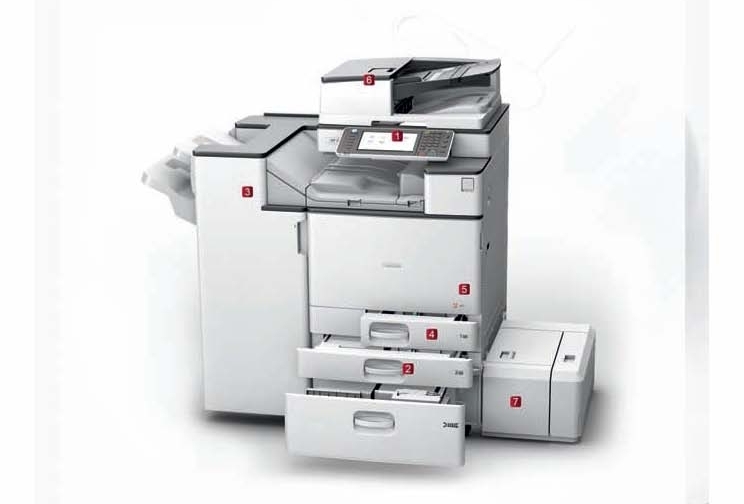 In addition, automatic duplexing minimizes paper consumption and operating costs. 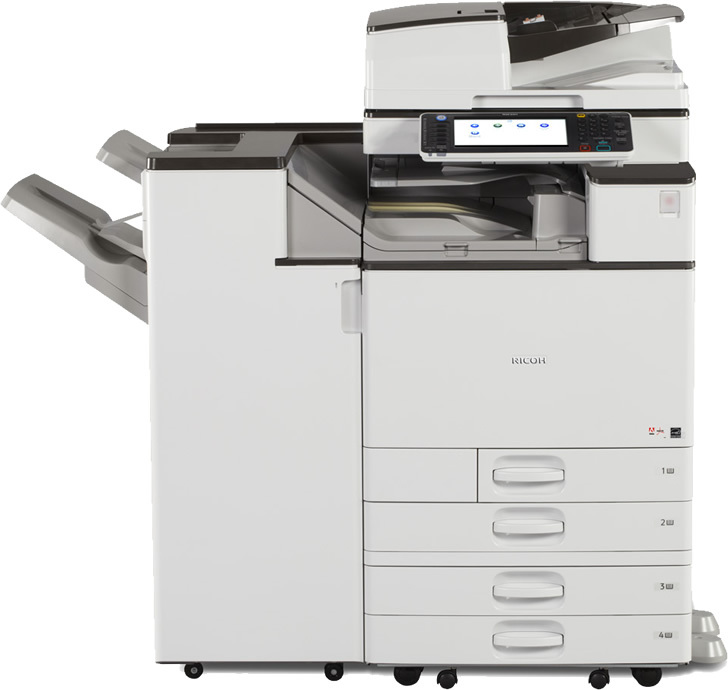 ● The MP C5503 comes standard with a large 9″, tiltable Color Control Panel with a customizable home screen and the ability to create one-click shortcuts for frequently used applications. ● The Auto Drawer feature completes the paper tray retraction automatically once the user begins to push the drawer closed. ● Paper capacity is an astounding 4,700 sheets with optional sources and the standard paper tray accepts a wide range of paper sizes, including envelopes. ● Users can also work more efficiently by copying the front and back sides of identification cards and other documents onto one side to save paper and time. 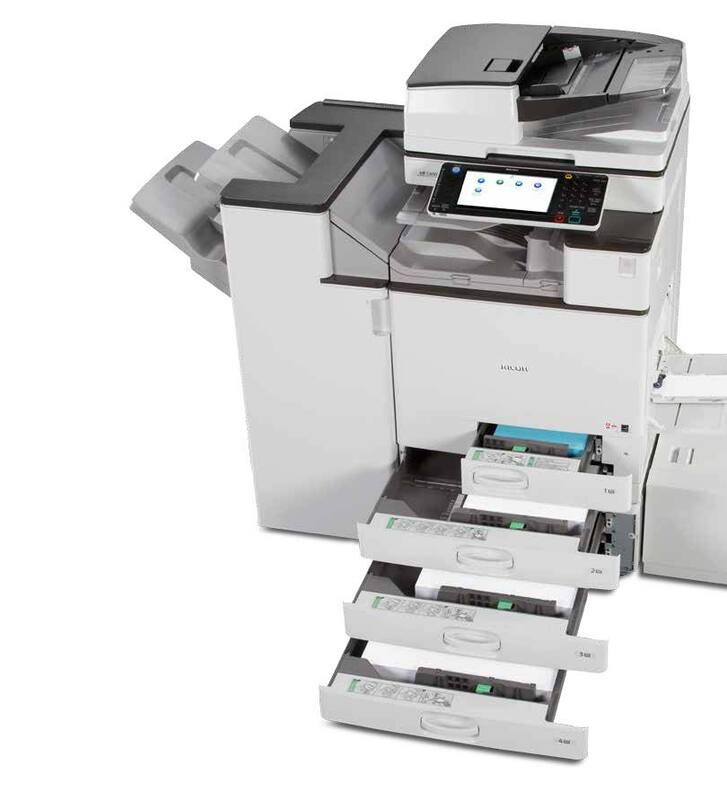 ● The MP C5503 can print from many mobile devices, including smartphones, tablets or laptops, without device-specific drivers for incredible on-the-go convenience. 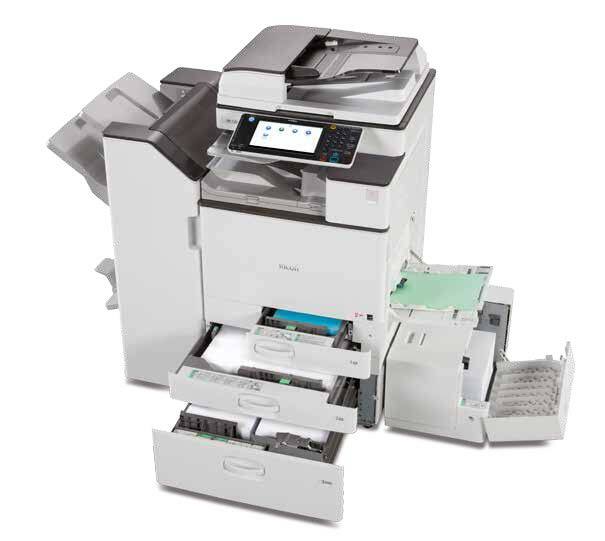 ● For organizations seeking even more secure mobile printing, the optional Ricoh HotSpot® MFP, or Ricoh HotSpot® Enterprise server software can be installed to help improve mobile productivity without compromising data, document or user security. ● Users can print JPEGs, TIFFs and PDFs using a USB drive or SD card right at the device without LAN access or native applications. 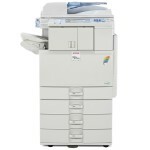 ● The MFP recalibrates as documents are processed for more stability with minimal color deterioration. Every page is delivered with crisp, vibrant, affordable color using patented PxP® toner at up to 1200 dpi — even on thicker paper stocks up to 300 gsm/110 lb. cover. ● Optional SRA3/12.6″ x 17.7″ support gives in-house graphic designers the ability to print crop marks for full-bleed printing. ● Use a Web browser to access system settings and address books or configure and monitor an entire fleet of Ricoh devices — right from your desktop. ● With a powerful processor and ample RAM, the MP C5503 enables your entire workgroup to produce impressive, fast-paced output. ● Streamline workflow and simplify execution with the one-click, preset interface driver or optional Adobe PostScript 3 driver. ● With advanced administrative controls, quotas can be set to limit outputs for specific users or workgroups. ● Get alerts and up-to-the-minute data when the device is low on supplies, experiences an error or needs firmware updates. Plus with @Remote®, you can even automate meter reads to maximize administrative efficiency. ● Ideal for graphics-intensive environments, the controller offers exceptional enhanced spot-color reproduction with RGB, CMYK and PANTONE® colors. ● Its easy-to-use Command WorkStation utility simplifies even the most complex print tasks, so documents can be created, reprinted or combined with ease. 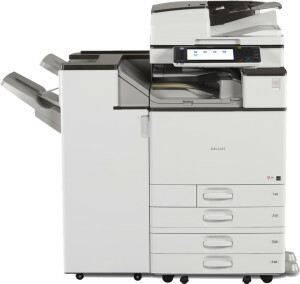 ● The optional built-in Web browser connects to Ricoh’s Integrated Cloud Environment (ICE) so users can scan documents, share files, print on the move and more without expensive, onsite software solutions. ● With optional embedded OCR, users can retrieve documents quickly by searching for specific words in PDF text in up to 14 languages. ● Take advantage of centralized Distributed Scan Management (DSM) while following specific preferences and rules to automate document tasks and improve productivity. ● Monochrome and color scanned documents can be sent to multiple recipients with Scan-to-Email/Folder/URL/FTP. 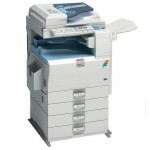 ● Compress file sizes for full-color scans and send them easily without compromising image quality. ● Take advantage of a wide range of optional software, including GlobalScan® NX and eCopy® to integrate advanced capabilities into personalized workflows and simplify the most complex tasks. ● Optional 10.1″ Wide Super VGA Smart Operation Panel offers the functionality and performance of today’s smartphones and tablets. Featuring drag-and-drop, pinch-and-flick functionality and swipe scrolling, it allows users to quickly move from one task to the next with unprecedented ease. 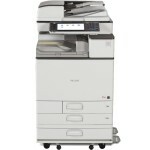 ● It includes convenient widgets for quick updates on the date, time and toner levels. The new panel also offers advanced Web Browser functionality on par with today’s personal computers. ● The new Quick User Interface feature simplifies the choices for the most frequently used functions for Copy, Scanner and Fax. They can be used with intuitive touch gestures, such as flicking to select addresses, and pinching to zoom in or pan out on a preview. ● For workgroups requiring enhanced feature functionality, it is easy to switch between the Quick User Interface functions and the traditional user interface. 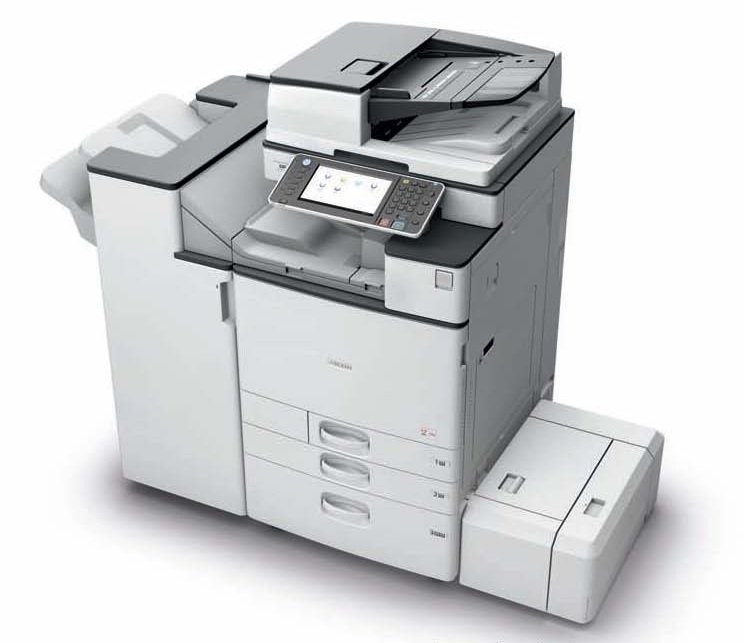 ● The MP C5503 includes user authentication to help prevent unauthorized access. 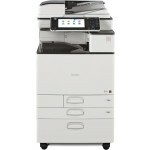 ● It enables users to store documents at the MFP until an ID card is swiped or password is entered to release them. A watermark can be added to confidential documents that will appear when unauthorized users attempt to copy them. ● Encrypted PDF transmission scrambles data on confidential PDFs to help prevent unauthorized access. 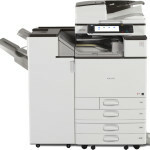 In addition, the MFP includes the standard DataOverwriteSecurity System (DOSS) that automatically overwrites any files on the hard drive to render them unreadable. ● HDD encryption adds another layer of protection against hackers.